Breadmachines simplify making homemade dog treats and homemade bread, and this selection of bread makers includes the top brands. I just love making homemade dog treats with a bread machine! There is nothing in the world that is easier. And, even if you are a veteran bread baker, you will enjoy the convenience of making dough, pizza and bread with a bread maker. The mini bread machine reviews that follow, give you information that will help you to make an informed decision, on buying the best bread maker for your needs. If you are new at this, you might want to read about how to choose a bread maker before you look at the reviews. In the interest of full disclosure, this is the machine I have and use all the time. I just love it! It produces consistently excellent results, and works great for making pizza and other dough--think dog treats! In exchange for its 2.5 pound loaf capacity, you have a fairly large bread machine that you probably won't keep on the kitchen counter. It weighs about 15 pounds, so it isn't hard to move to the pantry. This very well made bread maker does a great job. Its small size, about as big as a toaster, makes it easy to keep on the counter or to store. Of course, this "mini" breadmaker is just that--small, and it only makes a one pound loaf. This is fine for a single person or a couple, but a one pound loaf of bread is really smaller than you might think--and not big enough for a family. This Oster breadmaker is a very popular and highly rated breadmaker at an affordable price. The 13 hour programmable timer and Expressbake are nice features. The unit is easy to clean and has a 2 lb. capacity. You'll love the look of this stainless Cuisinart breadmaker! Leave it on the counter, or easily move it to the kitchen pantry. It's a typical size machine for a capacity of 2 pounds (makes 1 and 1.5 lb loaves too), and the handles are a nice touch. 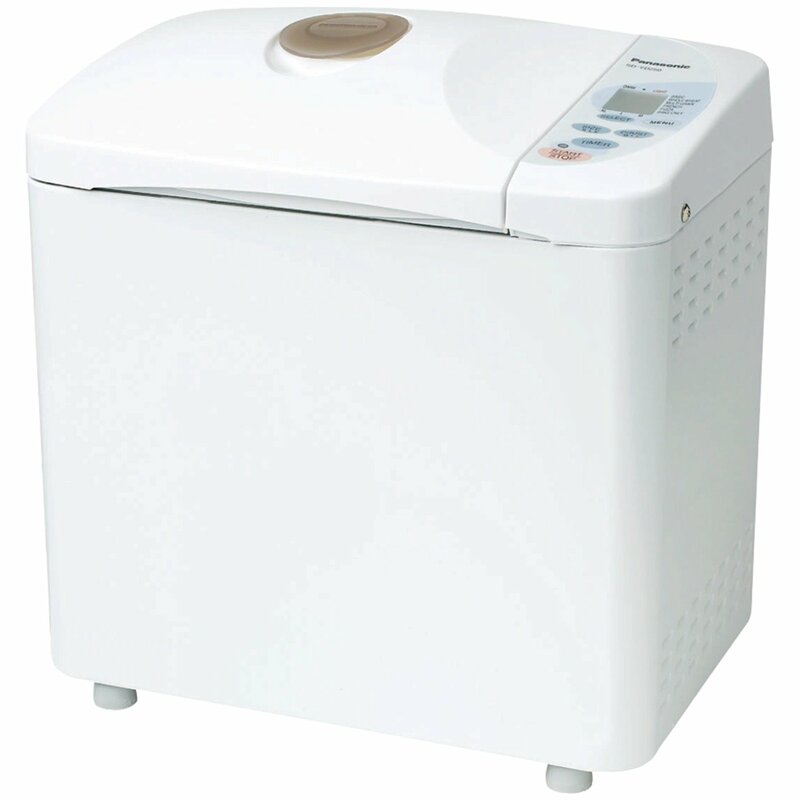 The Zojirushi BB-CEC20 is a well made 2 pound breadmaker that is very popular, despite its high price. This machine has two interesting features: two mixing blades instead of the normal one, and it produces a horizontal rectangular loaf instead of the vertical loaf you get from a typical breadmachine. This West Bend breadmaker has a good capacity to make up to a 2 pound loaf. It's on the large size, so you probably won't be keeping it on the counter. At 15 pounds, it's not that hard to move to the pantry. Like most bread machines today, it has a variety of features and works well. There is a dough setting for all you dog treat bakers, or for making pizza. The Expressbake is noteworthy because you can bake fresh bread in under an hour, unlike most breadmakers that take several hours. This compact Oster bread machine will make a 2 pound horizontal loaf, with 3 settings for the "darkness" of the crust. This popular bread machine gives you a choice of medium or extra large loafs, a nice feature. It's a nice compact size for keeping in the kitchen, and easy to carry to the pantry. It is easy to use and simple enough to get good results. The dispenser on top allows you to easily add fruit, seeds and nuts. This sharp looking black Hamilton Beach breadmaker features 12 program cycles and can bake a 2 pound loaf. A nice size for your countertop, it’s about a foot square. This West Bend breadmaker has features of the high end machines: 2 paddles and 4 horizontally shaped loaf sizes--1, 1-1/2, 2, and 2-1/2 pounds. For the dog treat baker, the 2.5 capacity is really nice. Of course, for just making bread (the main reason you'd buy it), it works extremely well and gives good results. This stainless steel Cuisinart bread machine is attractive and has a variety of settings--automatic adjustment of cooking time and speed is included. The Convection feature is interesting--a fan circulates air while the machine is baking, much like a regular convection oven in the kitchen. The Sunbeam 5891 is an economical 2 pound breadmaker and about average size and weight for this capacity. Most people get good results with this machine, and the 2 pound capacity is nice when making your dog treat dough. Of course, it’s also nice when making pizza dough, bagels, etc. Perhaps you have made bread, using a mixer with a dough hook, and then you kneaded it by hand. Or maybe you never even tried to make bread. No matter what your skill level, you will love using a bread machine for bread, pizza dough and dog treats. Breadmachines, literally, do all the hard work for you! homemade bread and homemade dog treats. Size - You’ll be storing your breadmachine, so it needs to be a convenient size for you to store—and move. If it is too large or too heavy, you won’t use it. Programmable - Many breadmachines now have a delayed start that you set with a timer. If you can delay the start you can wake up to fresh dough for your dog treats, or raisin bread for toast for your family! This allows you to bake while you are fresh, instead of later in the day, when you may be tired. Loaf size or capacity - If you will be making lots of dog treats at a time, whether for a dog bakery, for gifts or just to stock up for your own dogs, you’ll need to have a large capacity bread machine. Some breadmachines can make a large, 3 pound loaf (or dough). Dough cycle - Your bread maker must have a dough cycle if you will be using it to make home-made dog treats. Otherwise you won’t know exactly when the dough is ready. Appearance - If you will be leaving the bread machine on your counter, how will it look in your kitchen? Does it blend in with your other appliances, or would another bread maker look better? Manual and instructions - All breadmachines should have a manual. Are the instructions clear and easy to follow? Maintenance - How easy is your bread machine to maintain? If it’s stainless steel, do you have to polish it often? Can the tub be washed in the dishwasher or do you have to wash it by hand? Most breadmachines are easy to clean by hand, but if this is important to you, make sure you understand how complicated cleanup will be. Price - I put this reason last, as it should not be the only thing that you consider. Too often we look at the price of an item and we buy strictly on price—even if paying only a few dollars more would get us a whole lot more in value! Choose your bread machine carefully, considering the best value—but make sure you don’t skimp on quality! Click on a picture or a link above to see one of the bread machine reviews.